Cradlepoint recently announced that first responders will now be able to seamlessly transition to the Band 14 National Public Safety Broadband Network (NPSBN) developed by the First Responder Network Authority (FirstNet) and meet the mandates of the federal government. Cradlepoint’s new MC400L2 modem is the first solution with a full range of applications needed to coordinate emergency response efforts across public and private first responder networks. It is the first Band 14 solution that—when integrated with the AER product family—features full Unified Threat Management (UTM) security. Benefits of the new release include: routers can be deployed now and upgraded later when FirstNet is available; maximum reliability when paired with commercial LTE service; Ethernet WAN, or WiFi as WAN; and faster speeds with the Category 4 modem for AER, ARC, and COR product families. Additionally, Cradlepoint also announced new Category 4 modems for the AER, ARC, and compatible COR series products. This new modem will perform at higher speeds, support additional bands, and take advantage of carrier network improvements. The new modem will be embedded in the AER1600 and available as an accessory MC400 modem for the rest of the AER and ARC products, as well as a second-modem accessory for the COR products with a dock. 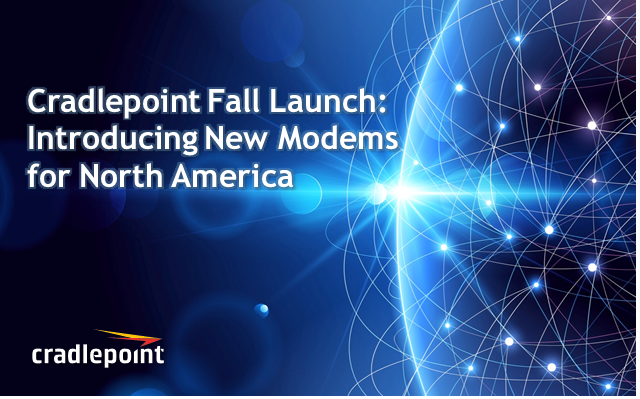 Join us for this webinar to learn more about Cradlepoint's new modem products for North America.